How do you show a non existing value inside a WPF ComboBox? Good question! And the sad truth is that you just cannot do it! WPF ComboBox shows only the values that are in its ItemSource. But don't worry, today I'll show you a workaround to this problem. 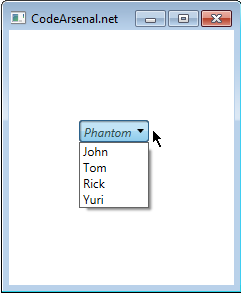 In this particular example inside a ComboBox will be shown a phantom value and when user clicks on it and choose another value from the list he will be prompted to confirm in order to give him a chance not to loose this phantom value in case if he clicked on the ComboBox by mistake. The trick is that I create additional custom ComboBox with TextBlock, binding it to the original one and overlaying it.